These bulbs are sold in quantities of 25 and 1000. Price is per bulb. 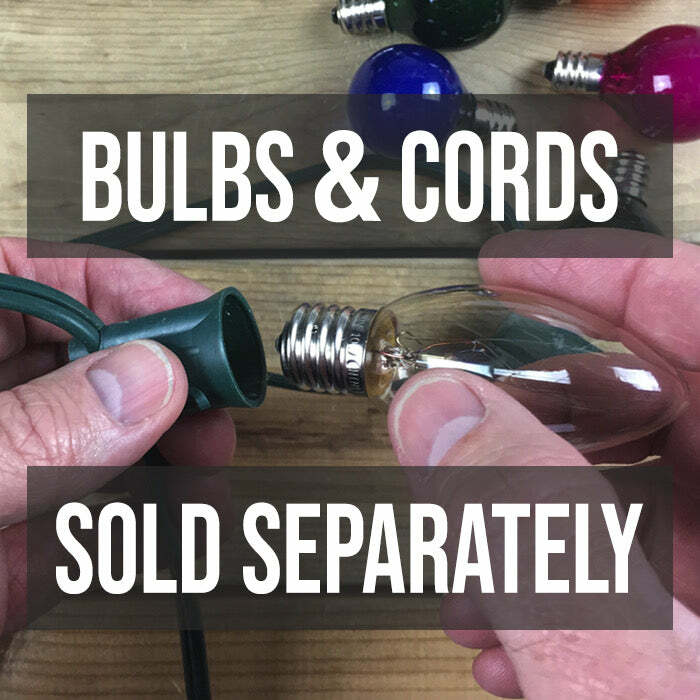 Install these bulbs in an existing C7 (E12) cord or shop for new Christmas light cords here. The photo is an application picture of a store in downtown San Antonio during the Christmas season. An estimate of the spacing between the bulbs is 12 inches - the most standard spacing in Christmas light installations. The use of the C7 bulbs adds to the light and airy feel of the entire display. Clear or White C7 bulbs are trumped only by their bigger C9 cousins when it comes to popularity during the Christmas season. They are commonly used to outline rooflines, accent tree trunks, and oversized wreaths. Draped between trees, strands of C7 light bulbs installed in white cords work well for party decoration. Before the trees fill in with leaves, you can wrap the upper branches of the tree and turn your backyard into a sculptural wonderland. Because of their slightly smaller size (about the size of a night light bulb) use these replacement bulbs in your own (or our) C7 stringers to wrap your tree's trunks before your guests arrive. Green cords work great for this application. Be sure not to exceed 200 bulbs (1000 watts) per standard household breaker. Their estimated approximate lifespan is 3000 hours and will ultimately depend on the installation environment and heat-related to installation. These lights can be used in animated displays but the animation will decrease their lifespan. Bought these to go with a 50 ft string. Bulbs worked great. Only had one go out in the first use. Packaged very well and have been working for the past two weeks with no issues. I only had 1 bulb blow out at 1st start. I will review all items with this one. The only thing I thought I ordered a 100' that had a plug in between. That was no problem and I can always add a break in between if I get tired of a hundred footer. By the way these are not for Christmas. They are for FREEZE protection on my Orange; Lemon and Tangelo trees. See now you have another selling point. Q: Do you have C7's incondescent lights in 7 watts or higher watt's? A: These bulbs are sold separately and are packaged in cardboard crates that hold 25 bulbs. The price listed is per bulb and they are sold in multiples of either 25 or 1000. The cords are sold separately to allow you to tailor the choice of cord to match your project. You have the choice of wire color, insulation thickness and socket spacing.